Generally speaking, trademark infringement deals with a person or business attempting to sell or selling goods, products or services as the goods, products or services of another person or business. The primary concern of liability for trademark infringement and trade name infringement and for unfair competition is the likelihood of consumer of customer confusion about the source of the business’s goods, products or services. The essential element of a trademark or trade name is the exclusive right of the business or business owner to use a specific word, slogan, device or product to distinguish the business’s product or service. Unfair competition, on the other hand, generally exists if the total impression or look-and-feel of the package, size, shape, color, design and name upon the consumer or customer will lead to confusion as to the source of the product. and he or she applies to register on the principal register in order to identify and distinguish his or her goods, products, or services (including a unique product) from those manufactured or sold by others, and to indicate the source of the goods, even if that source is unknown. In business litigation practice, service mark infringement is governed by the same principles as trademark infringement. 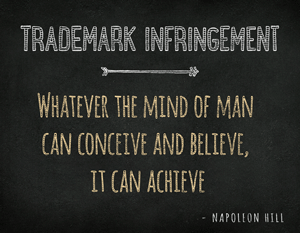 Trademark infringement's main concern is the likelihood of consumer of customer confusion about the source of the business's goods, products or services. A trade name is a word, name, symbol, device, or any combination thereof in any form or arrangement used to identify a person’s business, vocation, or occupation and to distinguish it from the business, vocation, or occupation of others. A trade name may be a personal name, corporate name, or fictitious name and it may be expressed by the addition of words or terms that are merely descriptive of the goods manufactured, produced or sold, or by a geographical name identifying the location of the business. However, exclusive rights, in most instances, cannot attach to the use of the additional descriptive terms or words, or the geographic designation.